The White House sought to reassure jittery supporters Monday that President Obama is not abandoning the fight for a public health insurance option. The move seemed to be a concession to critics, particularly Republican lawmakers who have assailed the idea of the government playing that kind of role. Yet it also stirred up frustration from those on the left who believe such an option is critical. “Recent comments by Obama administration officials regarding the public option and health reform are deeply troubling,” Rep. Barbara Lee, D-California, said in a written statement. Lee, chairwoman of the Congressional Black Caucus, said that “any bill without a public health insurance plan like Medicare is not health reform.” Former Democratic Party Chairman Howard Dean, a doctor and one-time presidential candidate, told NBC’s “Today Show” on Monday that he believes a public option “is the entirety of health care reform; it’s not the entirety of insurance reform.” A petition on his Web site StandWithDrDean.com reads, “A public option is the only way to guarantee health care for all Americans and its inclusion is non-negotiable.” Rep. Raul Grijalva, D-Arizona and co-chairman of the Congressional Progressive Caucus, warned that a significant number of House liberals would oppose any bill that does not include a “robust public option.” “Our position has not, and will not, change,” he said. “I will not support any bill that does not include a public option.” But making the issue negotiable might be a necessity for any legislation to pass through the Senate. Democratic Sen. Kent Conrad of North Dakota, one of six Senate Finance Committee members who have been trying to hammer out the first bipartisan compromise bill, said Sunday a public option simply won’t make it through Congress. “The fact of the matter is there are not the votes in the United States Senate for a public option. There never have been,” Conrad told “FOX News Sunday.” Watch bloggers give their opinions of the focus on the public option » Instead of a public option, the negotiators are considering a plan proposed by Conrad to create nonprofit health insurance cooperatives that could negotiate coverage as a collective for their members. Such cooperatives, which have already been established in cities such as Minneapolis, Minnesota, and Seattle, Washington, are designed to provide better coverage at a lower cost for their members in part by funneling profits back into the system. They are also designed to help alter the larger health care landscape by forcing private competitors to lower their prices. Liberal critics note, however, that membership in a cooperative is not free of cost. Cooperatives can — and often do — reject prospective members, and are therefore less likely than other public alternatives to help reach the goal of universal health coverage. Watch a senior medical correspondent talk about co-ops and the uninsured » Some conservatives, on the other hand, have suggested that any government-supported insurance option will create an uneven playing field in the industry. Private insurers won’t be able to compete, the conservative critics argue, eventually leading to a situation in which the government will control a great deal of the health care in America. “We have the best health care system in the world,” Republican Sen. Richard Shelby of Alabama told “FOX News Sunday.” “We need to expand it. We do not need to destroy it.” Supporters of a public option say it will create a badly needed level of competition, ultimately benefiting the public. 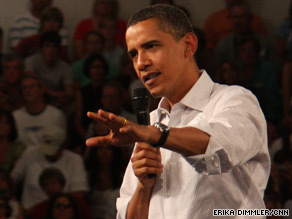 At a town hall event Saturday in Grand Junction, Colorado, Obama said, “I think that we can craft a system in which you’ve got a public option that has to operate independently, not subsidized by taxpayers — it would be nonprofit … they would have to go on the market and get a market price for capital.” He added, “I think there are ways that we can address those competitive issues.” But White House efforts to sway fiscally conservative Democrats — the so-called Blue Dogs in the House of Representatives — continued to run up against an apparent constituent backlash Monday. Rep. Allen Boyd, a seven-term Blue Dog, told constituents at a town hall meeting in his northern Florida district that he could not support the current House bill because it does not do enough to control exploding health care costs. Watch a report about the town hall meeting » One constituent nevertheless castigated Boyd for not doing enough to stop the push for reform. “If we let [House Speaker Nancy] Pelosi and people like that direct us, we are doomed,” the constituent said to loud applause. “We want Allen to … do a good job for us, like he used to do, but [he] can’t do that with that bunch of scoundrels.” Pelosi later issued a statement saying that “there is strong support in the House for a public option. … A public option will keep insurance companies honest and increase competition.” Speaking to reporters in his home state of Pennsylvania, Democratic Sen. Arlen Specter said Monday that Obama needs to clarify his preference for either cooperatives or a more traditional public option. The president now “has to make the evaluation as a matter of leadership as to what the administration wants to do,” he said. Can Health Coops Do the Job of a Public Plan?